WURTH’s full line of automotive products includes an extensive range of fasteners and hardware for all types of repair, maintenance, and refurbishment work. No matter what type of automotive work a company specializes in, we have the essential automotive fasteners and hardware that businesses use day after day. We also carry special sizes and types of automotive hardware for unique cars and special repair cases. The thousands of unique automotive fasteners and hardware pieces that we offer can complete the hardware stock of any auto body shop. Plus, with the WURTH SIS™ inventory and invoicing system, our customers can keep track of all of those small parts better than ever, increasing efficiency, organization, and profitability. 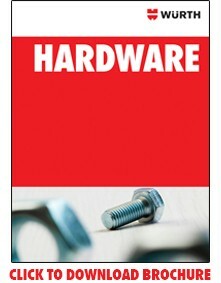 To see our complete line of fasteners and hardware, visit our online catalog.